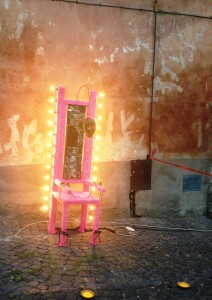 Ciao for Now, Casa Caponetti! Well, the last six weeks went by quickly, but it’s been a wonderful experience getting to spend my summer working on a farm in Italy. I’ve gained a ton of first-hand knowledge about planting and growing vegetables, independent research projects, and travelling by myself. I hope the practical farming skills I’ve gained here will stick with me and prove useful in the future, but I think the most valuable part of this summer for me was experienced on a more personal level. When I first arrived at the farm I was the only one working in the garden, shy and nervous about asking questions or messing something up. Eventually I settled into a routine, asked to be included in the decision making processes of managing the garden, and finally got people to save their 1.5 L plastic bottles for my experiment. I’ve figured out that in most situations, you don’t just get everything you need handed to you. Being assertive is something I sometimes struggle with, but over the course of my time at the farm I’ve learned how much of an ability I have to get what I want out of any experience. The opportunity to travel by myself has also been incredibly rewarding. There’s something about navigating multiple trains and buses in a foreign country and actually managing to get where you’re trying to go that can make you feel quite independent and satisfied with yourself. To my pleasant surprise, I made it back home without any bumps along the way – I didn’t miss any of my flights and none were delayed! I’m so thankful for my internship experience this summer and I’m excited to finish up the ag science major and make the most of senior year. Back to Ithaca in less than a week! In addition to my olive fruit fly control research project, I started a small experiment to test the effects of different potting mixtures on seed germination rates. 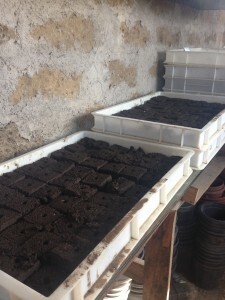 The method typically used here at Casa Caponetti is sprouting seeds in soil blocks with a mixture of 1 part soil from the farm, 1 part manure, and 1 part pre-made outdoor potting soil with peat and fertilizer. I wanted to see how effective it would be to keep the amount of regular soil the same, and change the ratios of manure and potting soil. I sprouted lettuce in 4 different combinations: 1 part farm soil and 2 parts manure, 1 part farm soil, 1 part manure, 1 part potting soil, and 1 part farm soil and 2 parts potting soil, and a control of 100% pre-made potting soil. As one might expect, the pre-made potting soil seems to be the most effective in germinating seeds quickly, since that is what it’s designed for. The sprout heights were measured, and the ones that germinated in the potting soil were longer than those in the other three mixtures. This was likely because there is fertilizer in the potting soil already, which speeds up the growth. 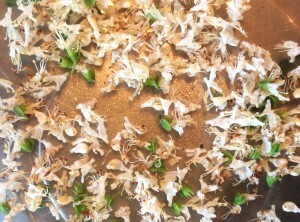 The combination of just soil from the farm and manure was very unsuccessful, and only resulted in 3 out of 27 seeds germinating because of the high levels of ammonia in the fertilizer. The mixture of equal parts manure, potting soil, and farm soil was not far behind the 100% potting soil group and seems to be the most effective texture for making the soil blocks. It’s an added bonus that this mixture uses resources that are already on the farm and reduces the amount of external resources needed to produce and transport the potting soil. It is also a less expensive option. The unbearable heat here was broken a couple days ago with a thunderstorm! Even though I’ve experienced plenty of those in Ithaca, they’re always kind of exciting for me as a native to the San Francisco bay area. The rain was refreshing and much needed, and I’m hoping (for the sake of my research project) that it will bring some olive fruit flies. Of course, for the sake of the olives, I hope it’s not a bad year. Despite my hope that over the course of six weeks in the summer I would catch some, I have two weeks to go and still not a single fly in sight. In the meantime, I have been working on a description of my experiment and instructions for checking the traps to leave for the garden manager and future volunteers at the farm. It will definitely be interesting to see if this experiment helps with the olive fruit fly problem later in the season, but I still hope I can see my project in action before I leave. I also started another small project to test whether different ratios of manure, potting soil, and soil from the farm had effects on seed germination times. 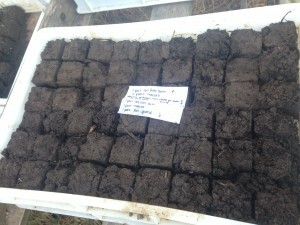 I have planted four trays of 54 soil blocks each with lettuce and St. John’s wort in different potting mix combinations. Hopefully this will yield some helpful results for the farm, and it could be an interesting comparison between the effects on cultivated plants vs. wild herbs. In the garden we are starting to get TONS of tomatoes (well, kilograms, but still), which is exciting because that means delicious salads and pasta! 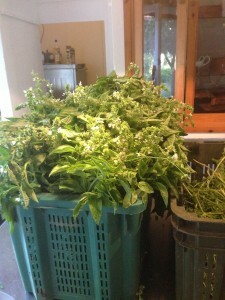 We also needed to cut back the basil and ended up harvesting five bins packed full of it! 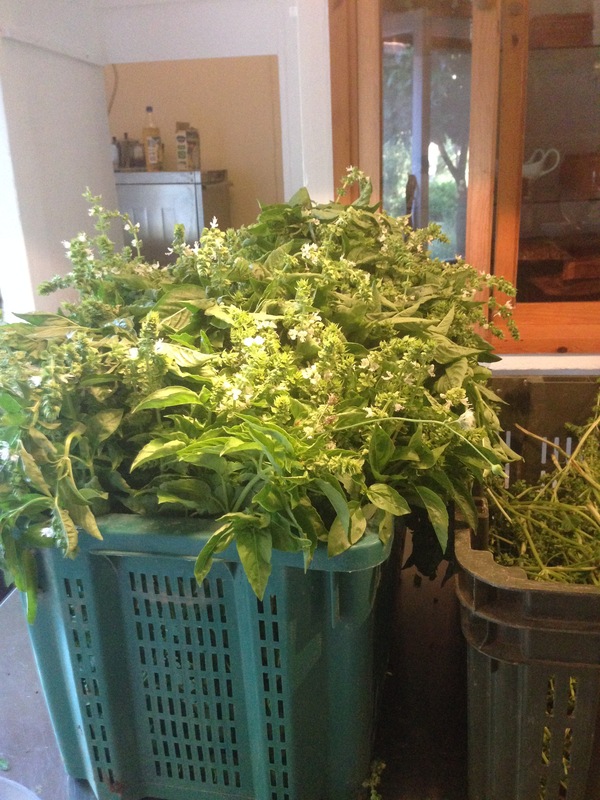 I got to help clean some in the kitchen where it will soon be made into pesto. I also learned an interesting tip: to keep the basil from oxidizing and turning brown once it is made into pesto, the chef here blanches about half of the leaves that will go into the sauce. The rest are blended up fresh because they have a stronger flavor, so you get a delicious and green pesto! 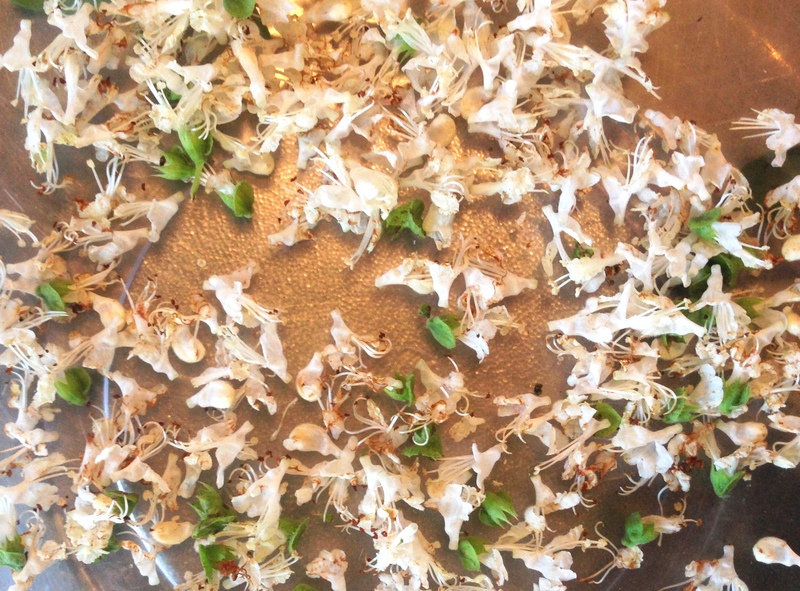 You can also eat the basil flowers, which are sweet but quite delicate and tedious to pluck off. I would love to try out a basil flower pesto soon though! This much pesto, times 5. 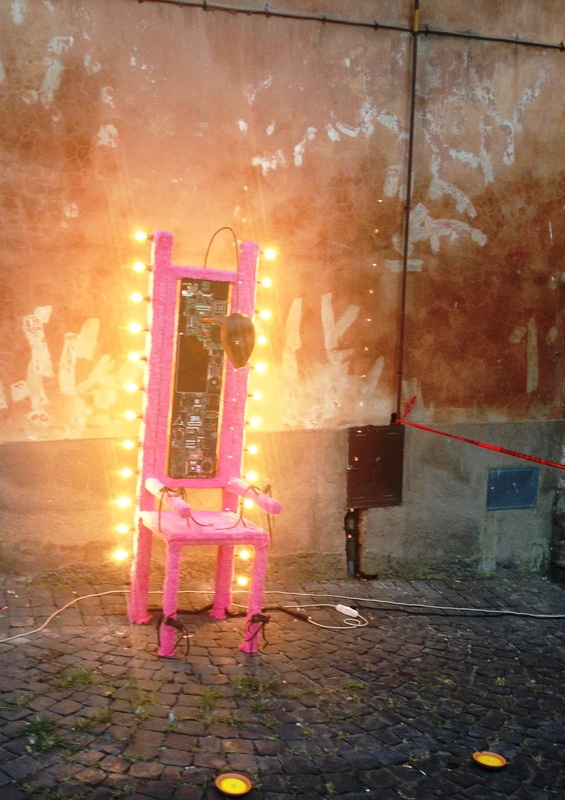 There was a “Notte Bianca” festival here in Tuscania last weekend, which was a night of festivities where the streets of the town were filled with vendors selling food, drinks, and artisanal goods. From what I’ve heard, the name of the event, meaning “white night,” comes from an expression that refers to being unable to fall asleep all night. Apparently the tradition was started in Paris, and the idea is that all the shops stay open and everyone stays up all night celebrating. 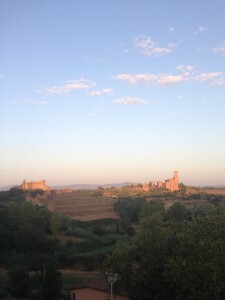 The Tuscania one only went until about 1 am, and I was home by 11 and was (very) able to fall asleep. I got to try some deliciously interesting food though! I had some sort of fried ball of lavender risotto, and fried squash flowers, which I can’t believe I’ve never had before! I’m also hoping to experiment with cooking the many squash flowers we have here on the farm sometime soon! I’ve also learned that cucumber flowers are quite refreshing in salads. That’s all for now, but I’ll keep posting about my culinary and agricultural adventures! Now that the garden manager, Marco, is back, I’ve had someone to work with more regularly and learn a lot about vegetable production. 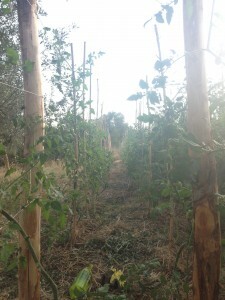 While Casa Caponetti was more focused on expanding its restaurant and B&B in the last couple years, they are hoping to increase production in the vegetable garden this fall in order to sell at a market in Rome. 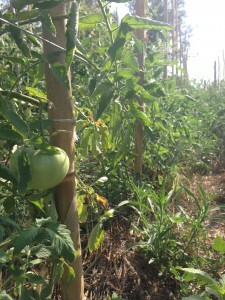 Since the growing season in this area is quite long, we have been doing a lot of transplanting and starting new seeds. 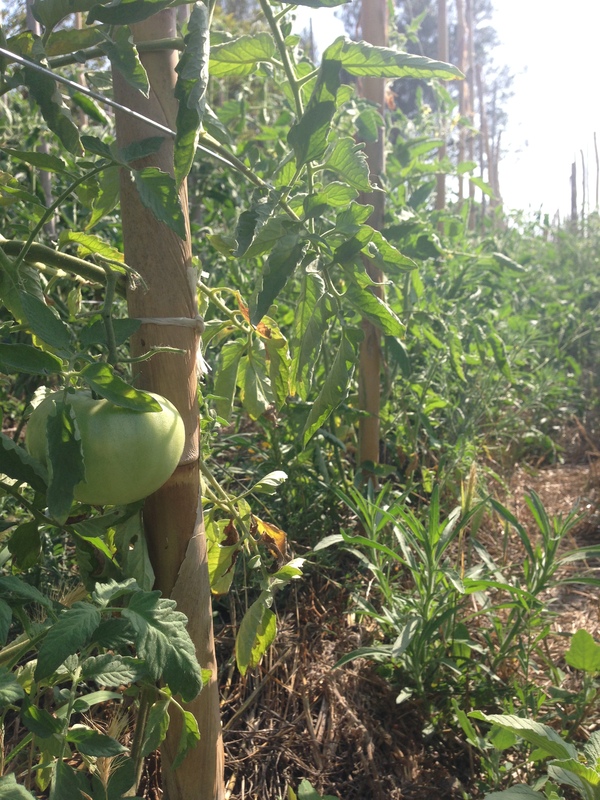 I’ve also learned how to prune tomatoes (some were very overgrown) so that they have enough room to grow without becoming overcrowded, creating too much humidity. We’ve planted peppers in the same rows as the tomatoes where there is extra space or a missing plant. We are also starting a lot of seedlings for zucchini, fennel, green beans, and cucumbers. The seeds are started in soil blocks, which are made with a tool that sort of stamps out containers of potting soil into small square chunks. 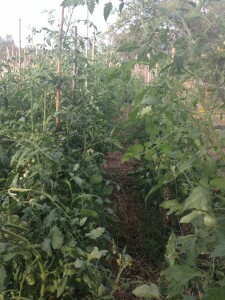 It gets really hot here during the day, so the seedlings are covered and kept in the shade until they sprout. Once leaves come up, we have to make sure they constantly get enough water until they’re planted in the ground. When I’m not in the garden, I have also been working on an independent research project to test the effectiveness of a particular type of homemade olive fruit fly trap. 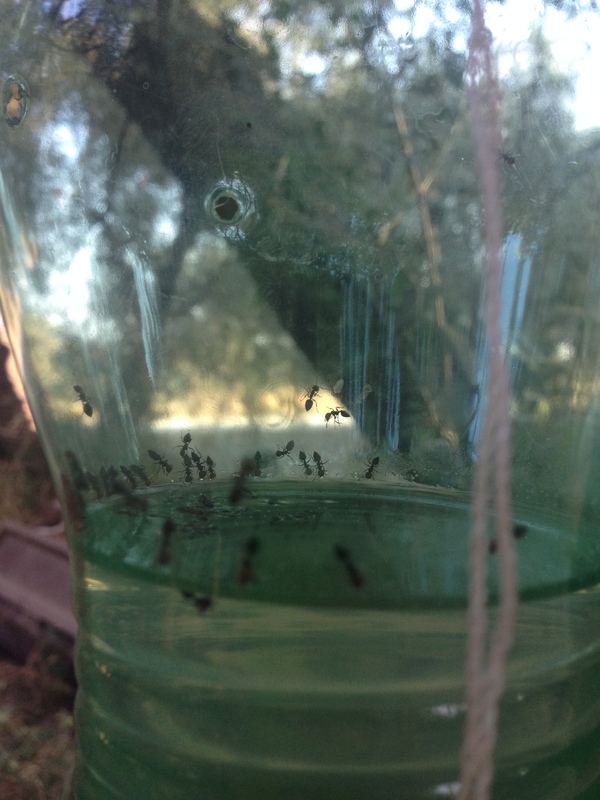 Olive fruit flies (Bactrocera oleae) devastated the olive harvest for much of Europe in 2014. They oviposit into the olives as they are ripening, and the larvae hatch and live off of the fruit until they emerge as flies in the fall. The trap I’m examining was developed at an organic olive orchard in Spain and is called the OLIPE (short for Olivarera de los Pedroches) trap. It is made by melting holes around the neck of a plastic 1.5 L bottle and filling it with a solution of 1 L water and 3 Torula yeast tablets. These traps are known to work particularly well for combatting the olive fruit fly, but unfortunately I seem to have come at the wrong time of year to successfully test their effectiveness. 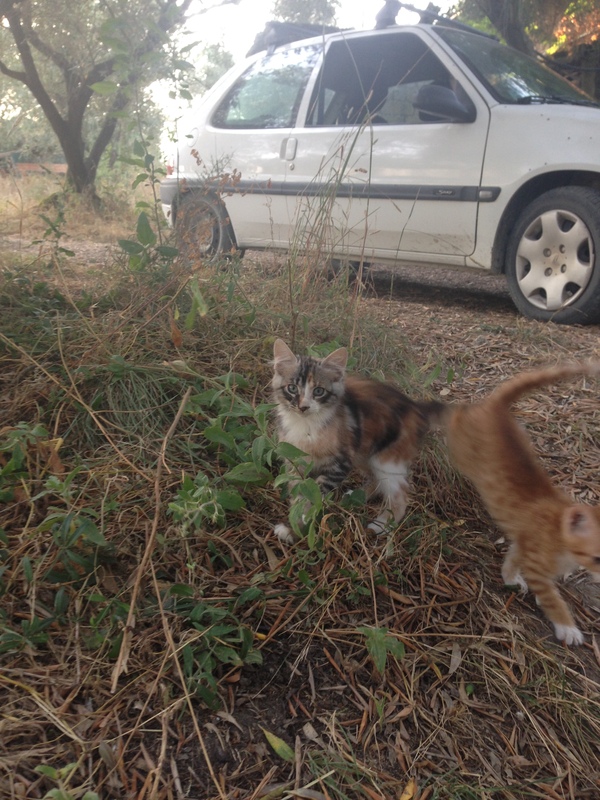 The conditions have not been as favorable for the pest this year as they were in 2014, which is great for olive farmers, but a bit of a struggle for my research project. I have been having a hard time identifying them and am not sure if I have caught any at all yet. Luckily the garden manager would be able to continue collecting data for me after I leave, so I’ll see how things go in the next couple weeks. Wish me luck! Hello everyone! I am happy to say I finally made it all the way to Italy! 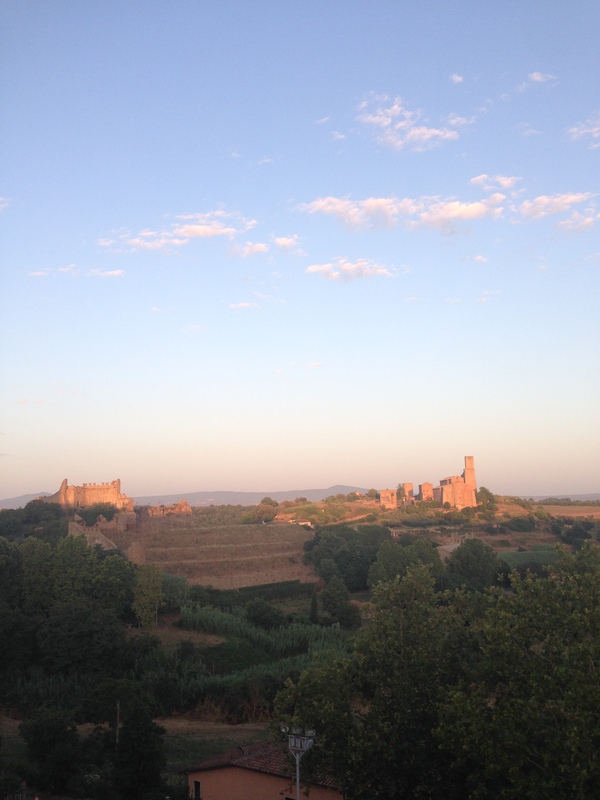 This summer I am doing an internship at Casa Caponetti, an olive orchard and organic farm in a small town called Tuscania, about 60 miles north of Rome. After spending a night in London due to flight delays, losing my luggage to the chaotic conveyor belts of the Rome airport, two trains, and a cab from Tarquinia to Tuscania, the journey (that is, multiple giorni) seemed to take forever. Apparently there is a store in Alabama that sells lost luggage, and I had pretty much accepted that as the fate of my bag about an hour ago, when someone drove up the dirt road and delivered my missing backpack! So that has made this experience much more enjoyable. Casa Caponetti is in general a quite enjoyable place to be. 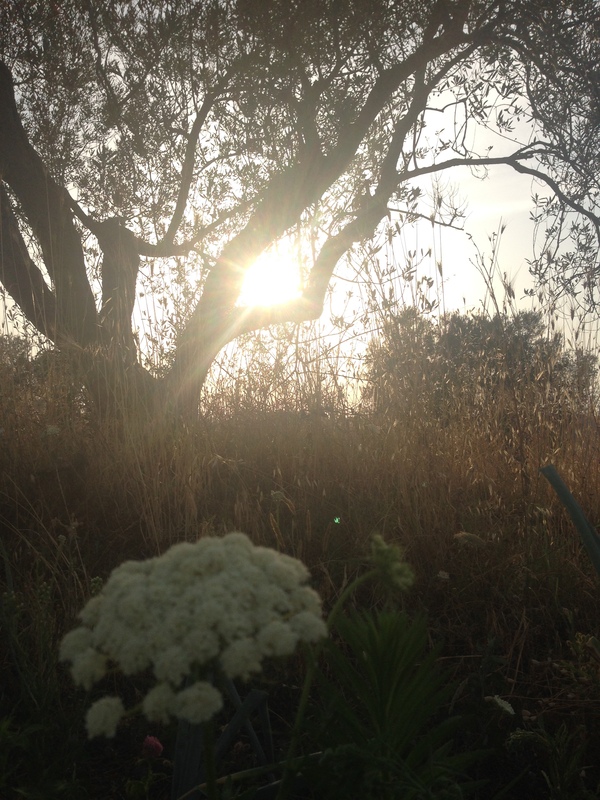 My first views upon arriving were of rolling hills dotted with olive trees, horses and sunshine. 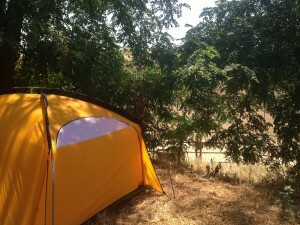 The heat in the middle of the day is made bearable by a trusty breeze that always seems to pick up in the afternoon. It’s pretty exhausting to work outside under the sun all day, so my day is divided by a long siesta after starting farm tasks between 7 and 8 am. After work in the morning, I make lunch and work for a few more hours around 4 or 5 pm. By 9:30 I’m tired enough to fall asleep before the sun has completely set. I’ve actually been sleeping in a tent for the week since there is a large group of Butoh dancers staying in the volunteer cabins. They work on excavating the Etruscan necropolis that lies beneath the grounds of the farm, working with inspiration from this experience to culminate in a dance performance at the end of the week. We share a kitchen, and many of them speak English really well, but I am still trying to pick up bits of Italian. I definitely overestimated my capacity for language-learning, and had high hopes that it would be easy since I have a pretty good background in Spanish. It’s also been harder to motivate myself to learn it because everyone I need to talk to speaks English either fluently or well enough to get by. 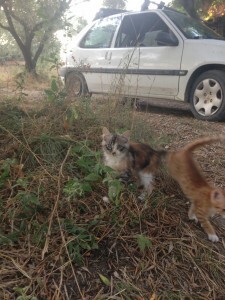 The exception is Stephano, one of the people who works with me in the gardens. He speaks to me in a particular Tuscanian dialect of Italian and I don’t understand a word, but I make a lot of blank expressions and get by using gestures. 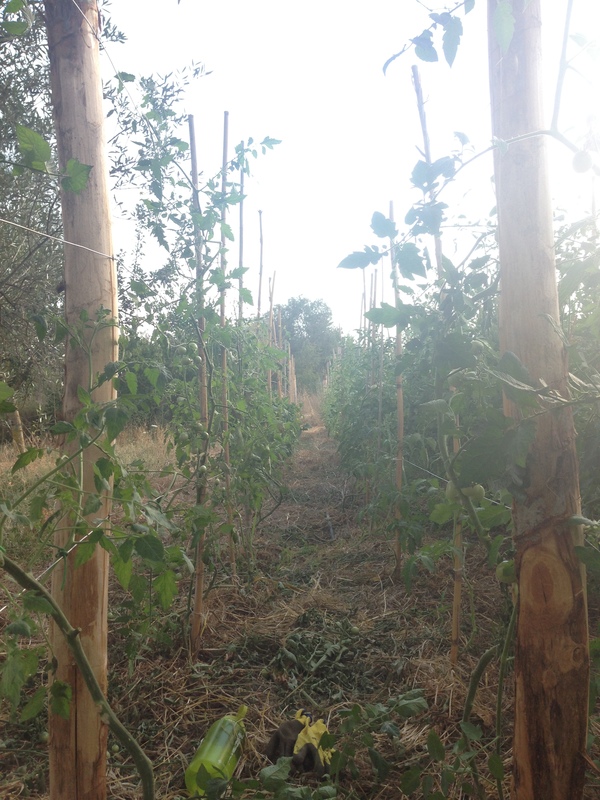 So far I’ve been doing a lot of weeding, learning how the irrigation system works, trellising tomatoes, and harvesting zucchini and cucumbers. There is more basil than I can possibly imagine eating, which is also really exciting. Apparently there is another intern from Cornell coming next week, but I don’t know anything about him other than that I think his name is Danny. Anyone out there? Hope to see you soon if you happen to read this! I am looking forward to getting settled in more now that I have my luggage and will soon move into an actual cabin. Tomorrow I plan to check out the excavation site with the dancers. More to come soon! My new home for the week!